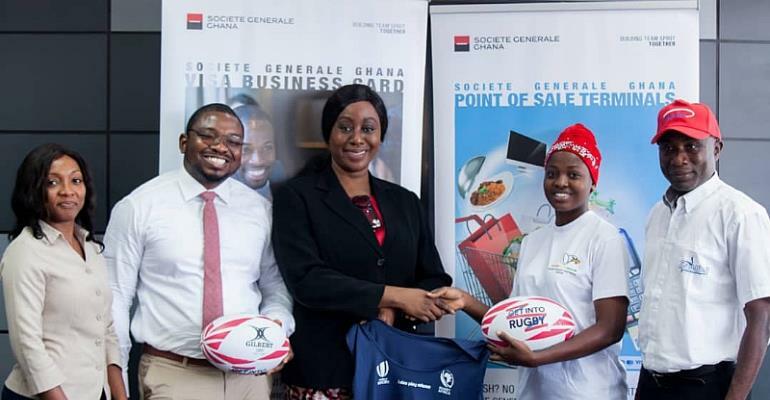 Societe Generale Ghana and Ghana Rugby announced their intention to build character for youth together based on the World Rugby “Get Into Rugby” (GIR) youth development programme that is underpinned by the Rugby values of integrity, passion, solidarity, discipline and respect. The announcement was made at the Secretariat of Ghana Rugby during a meeting between Mr Daniel Rex Danquah (External Communication Officer, Societe Generale Ghana), Ms Angela Nanansaa Bonsu (GM Company Secretariat, Societe Generale Ghana), Ms Jannifer S. Darko (Community Manager, Societe Generale Ghana), Mr Abdul-Aziz Issah (Board Member, Ghana Rugby) and Ms Rafatu Inusah (Board Member and ‘Get Into Rugby’ Coordinator, Ghana Rugby). According to Mr Danquah, Societe Generale has been involved in Rugby since 1903 and the bank became the official bank of French rugby in 1987. Societe Generale is also the official banker of Ghana Rugby and is a major partner of the Rugby World Cup in Japan later this year. Danquah continued to say that Societe Generale is proud of its strong bonds with Rugby globally and hope that this will be the start of a mutually beneficial relationship that will last for many years. Mr Mensah, President of Ghana Rugby, said in a message from London that the step by Societe Generale to also support the youth developments in Ghana is a major historic moment for Ghana Rugby. “The development of youth and women rugby has been high on my administration’s list of priorities since we took over the administration of Ghana Rugby on 5 June 2014. 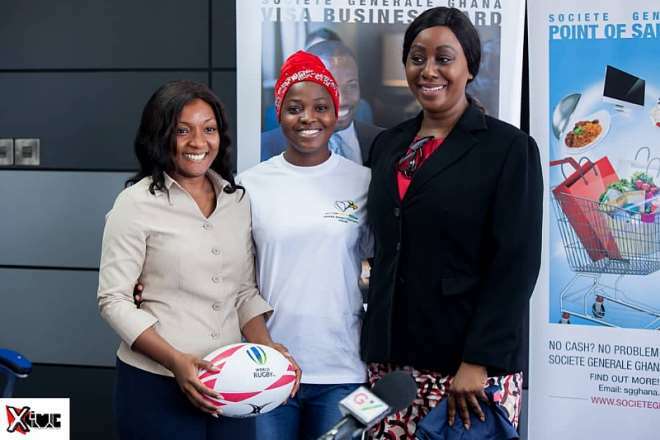 The World Rugby “Get Into Rugby” programme forms the foundation of our rugby development in Ghana and it can only reach the millions of children in Ghana with the support of institutions like Societe Generale,” Mensah said. 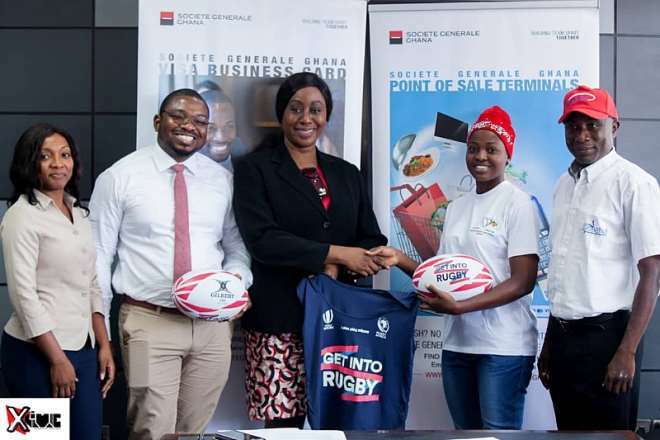 Mensah also welcomed Societe Generale Ghana to the growing list of corporate sponsors, and thus Friends of Ghana Rugby, including the Panafrican Equipmentment Group, Interplast, the Gino Brands and Sunda International to name a few. “We need all the support we can get and this gesture by Societe General Ghana and the recent donation of US$ 10,000 by the Ministry of Youth and Sports gives me hope that we will be able to fulfil our mission, namely to grow the rugby Family to all corners of Ghana,” Mensah said. Ghana Rugby Board Member and President of the Greater Accra Rugby Association (GARA) also expressed his appreciation to Societe Generale and welcomed them to the Ghana Rugby Family. 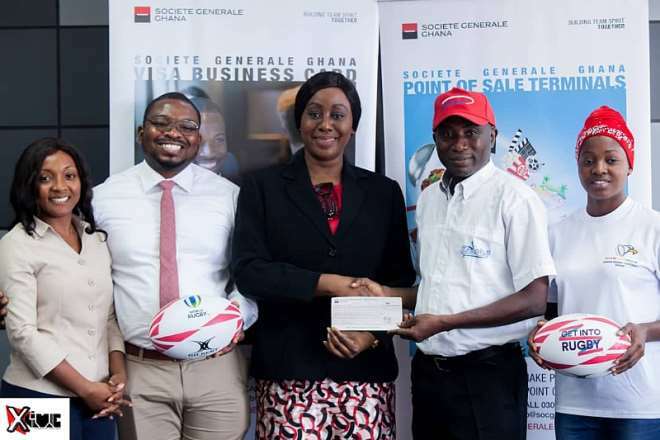 “We have had a long-standing relationship with Societe Generale as our bankers and we hope that this sponsorship relationship will also grow over time as we grow and expand the footprint of Rugby all over Ghana,” Issah said.